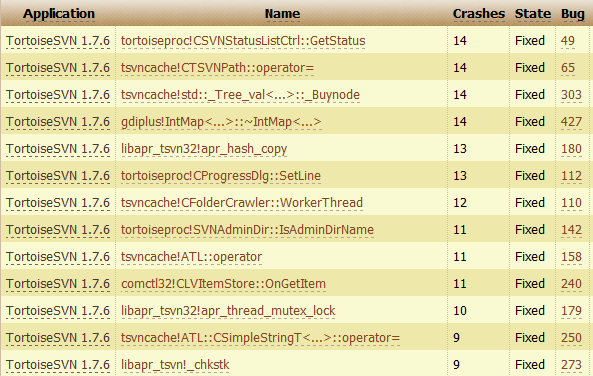 TortoiseSVN has used its own crash handler since the very first release. 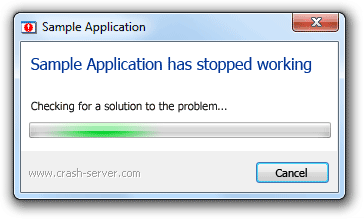 If TortoiseSVN crashed for any reason, a dialog is shown which allowed you to send the crash dump to us. We then analyze those crashes and fix whatever caused them. This helped us to make TortoiseSVN much more stable (stop laughing, it could be worse!). For a long time, sending the crash dumps to us only worked via email. With Version 1.7.6 that changed: we started using crashrpt which allows to send the reports via http. While before 1.7.6 we got maybe 4-8 reports a day, now that changed to +100 reports per day! I guess that most of you either only used web mail or didn't wanted to send the reports from your email account. With the http send, this isn't an issue anymore and that's why we now get so many reports. As you can imagine, it's simply not possible to analyze that many reports manually anymore. So as of version 1.7.7 we're switching our crash reporter once again. But not back to an email-sending one, but one that offers a lot more features: drdump.com. Also instead of only sending a minidump, it can send us a full dump if the crash hasn't been previously reported. We also can ask for a full dump in case the minidump we have does not provide enough information to fix the problem. Another nice feature is that after you've sent the crash report and the problem you're experiencing has already been fixed, you're automatically forwarded to the corresponding page in our issue tracker. There you can find out more about your problem and decide for yourself if you want to download a nightly build or not. drdump.com is available for free for open source projects. Pricing for commercial projects is shown here. If you want to find out more about how this works, there is a nice video available that explains the basics, a more detailed description and a tutorial on how to integrate it into your own application. 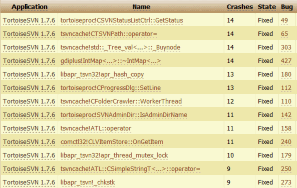 With so many crash reports we get, we simply don't have the time to analyze every single one of them and that's why we rely on the grouping of the reports on drdump.com. Every sent report is first automatically analyzed and if the same crash was already reported before moved to the corresponding problem. That problem then has its crash count increased. As you can imagine, we try to fix the problems with the highest crash count first. If you encounter a crash, then please send the report. It will increase the crash count of the problem and therefore also increase the priority for us to fix it. Even if you've sent the report before, please send it again if the crash happens again. Because it might not be the same problem even if it appears to be. And if it is, then it will increase the priority of the problem.